We at DAS, believe in providing the most realistic weapons-based individual and collective training experience available to Military and Law Enforcement Professionals around the world. By producing high fidelity, fully immersive training/gaming software complete with streamlined hardware that is easy to setup and use. DAS has created the Virtual Interactive Combat Environment (VICE) for Military and Law Enforcement Professionals Globally. VICE is a small unit tactical training simulator that immerses US/Foreign Military Soldiers, Sailors, Airmen, Marines and Law Enforcement Personnel into high fidelity virtual environments to train hyper realistic virtual/simulated/live individual and collective tasks with live service weapons. VICE specializes in the tactical marksmanship, buddy team, fire team, squad and platoon collective level operations, bridging the gaps between current simulation trainers and live fire training. VICE is commercially available and fielded in both CONUS and OCONUS, and provides a safe, efficient, cost effective, next generation training experience for today’s and future war-fighter and security professionals. VICE Marksmanship Training bridges the gap between simulated marksmanship and live fire training requirements by allowing the customer to train their entire basic, advanced and tactical marksmanship programs utilizing their personal weapon systems and optics, both primary and secondary, to conduct each task in multiple virtual ranges and environments. VICE facilitates the ability to master basic weapon fundamentals such as grouping, zeroing, location of misses and hits (LOMAH) and qualification prior to going to the range for live-fire exercises. The four firing fundamentals (sight alignment, steady position, breathing, and trigger squeeze) are grasped and reinforced through experiential utilization through realistic firing at targets and enemy personnel, then progressing to advanced skills and firing exercises under tactical conditions. Shooters also acquire understanding of weapon maintenance and weapon function checks, to enable shooters to properly assess and correct any malfunction to keep the weapon operating properly in a gunfight. 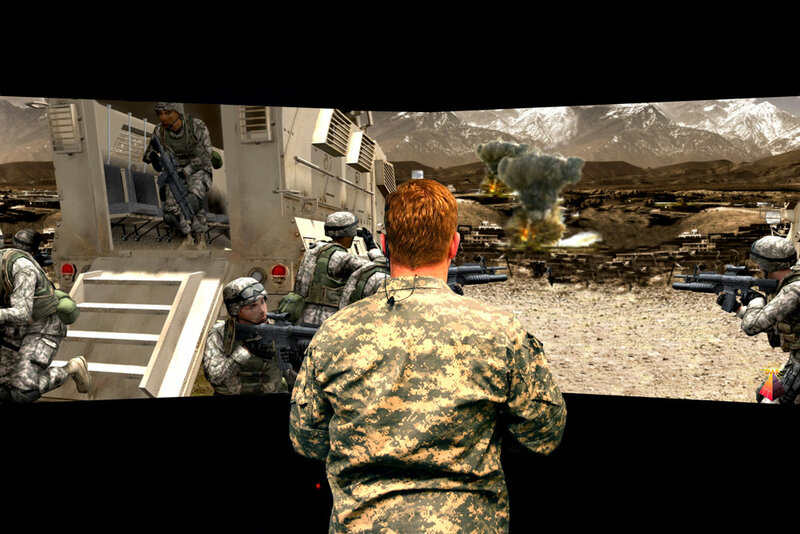 The Virtual Interactive Combat Environment (VICE) is the only proven commercial-off-the-shelf training system that enables Military/Law Enforcement and Security Forces to plan for and execute training with the latest weapon systems (Live/Blank/Non-Lethal/Replica), tactical gear, and communication devices, all while utilizing the most up-to-date active shooter protocol, tactics, techniques and procedures. VICE immerses each trainee into a realistic geo-typical/geo-specific 3-D environment that can be manipulated in real time to represent actual situations, decisions and responses that occur during authentic active shooter incidents. Military/Law Enforcement and Security Forces must conduct force on force exchanges (physical, visual and verbal) utilizing personal service weapons (primary/secondary), multiple ammo types, DAS Talk®, driver’s stations and immersive actor stations to reenact life-like events in real time. VICE tracks shots fired and location of hits and misses on each person training inside the Student Stations, enabling casualty response and critical care for Military/Law Enforcement and Security Forces involved in the training event. No more repetitive branching video scenarios, just real events, real people, real equipment, and real decisions. VICE interactive simulations are used to train law enforcement officers for scenarios they may encounter out on daily patrols worldwide. We place officers in virtual environments using non-lethal training rounds in scenarios that are designed to replicate real-life events that officers may encounter in the field, ranging from traffic stops, domestic violence incidents to active shooter situations incorporating realistic gunfire, explosions and bodily injury with a high degree of realism. The officers are equipped with a variety of tools including, baton, taser, and their live service weapons with recoil kits that recoil and weigh the same as an authentic firearm. Our system has the ability to create unlimited highly-effective educational scenarios which challenge officers' decision making ability and help develop life-saving skills to prepare law enforcement personnel to be highly effective in life and death situations. "You can always tell the difference between those who have used VICE and those who haven't," a private told me. "That's because VICE-trained soldiers have better communications skills, both verbal and nonverbal." “VICE is a training tool that allows us to put Soldiers or students into an environment where they are able to maneuver, shoot and communicate as a squad,” said Frank Dulisse, VICE instructor.